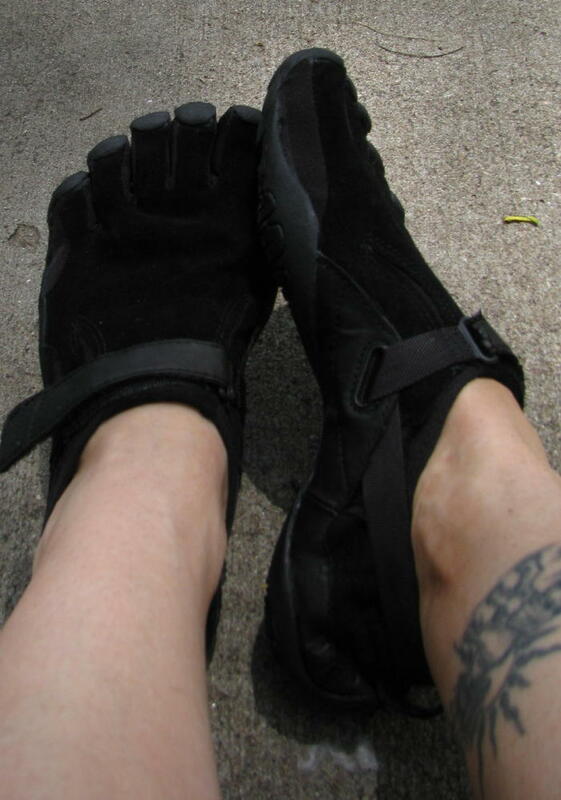 I was so fortunate to have been sent the Vibrams Five Finger KSO Treks early last summer to try out. I find it very hard to wear shoes when its so warm out so only wore them a few times often telling myself I needed to get them on to test them but the warm days won out. I did however wear them at the Living History Farms Race in November and they were PERFECT! Its high time I get a formal review finished since I am wearing my arsenal of minimal shoes more often this very cold Iowa winter! When I first got them out of the box I rolled them up in a nice little ball to test their flexibility and weighed them. My size 42's are just under 6 ounces each. summer right after receiving them and going on my first run in them. I was nervous about them not having enough traction for the muddy and slippery conditions of an XC race. I surprisingly zipped past people on the course as they struggled to gain footing up the steep creek wall inclines. I would dig in to the muddy and slippery creek bed walls with my gloved fingers and VFF toes and felt even more primal than what one would expect from running like a barbarian through the woods. The ground feel was just enough to maintain good form and the protection was excellent. I stepped on a 3 inch sappling stump hiding in the leaves that would have seriously injured my arch had I not had protection. Even with the Treks I had a bit of a bruise. I love the look of the Vibrams Five Fingers. The colors and styles both suite the sassy side of my personality. I would love to try a pair of the Sprints. They look like a Tim Burton designed Mary Jane shoe! I have been of the opinion that the separated toes lead to cold toes in the winter. Its like the comparison to gloves and mittens. Mittens are warmer although with mittens you loose the use of individual fingers. Thats the tradeoff with the VFF as well. 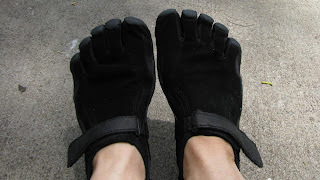 The secret to wearing the VFF in the winter is to keep moving and keep the blood flowing! Staying warm before the LHF XC race. At the race I took the downhills cautiously as the trail, when there even was a trail, was leaf covered, wet, and slippery. I was pleased that I was able to have steady footing and had no trouble scrambling through the rock strewn creeks. The Treks dried faster than I thought they would considering they are Kangaroo leather. I wore wool injini socks with them and felt that they aided in my ablility to keep my toes warm. For the 2009 LHFR I wore Teva Proton 4 water shoes and slipped and slid around. I thought that the traction was adequate on those however had not had something to compare them to. Now that I have tried the Treks I know without a doubt that my over 8 minute PR at the 2010 race was due to my shoe choice. Very wet and muddy at the finish. The race was over 7 miles with 9 water crossing and took me 1:13 to finish. My toes were quite frozen at the finish and I was glad to be eating and sipping hot apple cider at the finish line. I thought I would state matter-of-factuality that I would choose a different shoe for cold weather however when there is water involved I don't think any shoe would keep your feet warm through nine water crossings. They did a great job for what I needed them to do although having the toes all together would be warmer. Its a matter of degree. All of my layers did not keep the cold out when I stopped running. As long as I kept moving I felt great including my cold toes. I wore the Treks during the summer at times on the road when I was running high mile weeks and my soles were tender from running twice a day. They are a little clumsy on the roads and I don't have the same ground feel however they are an excellent minimal shoe considering my opinion is one of a purist in the warm seasons and prefer going barefoot. I could still maintain a midfoot landing even though the ground feel was reduced. On longer runs (wearing them without socks) of over 8 miles, I would get hot spots on the inside of my right arch and would have blistered had I kept going. I like the feel of wearing them sans socks however the rubbing was a problem. It may be something to just get uses to. I have had the same experience with another minimal shoe in the same spot. I love to wear the VFF KSO Treks as my work shoes. I work for nuun active hydration and am the Iowa Team Lead. My current work uniform is black pants, black nuun shirt, and my black Treks. They are very comfortable however after a long day of work my toes feel achy from being separated but my feet do not feel achy in general after being on them all day. They have gotten stronger in fact from the zero heel toe drop. I love how they are a conversation starter. I have had many enjoyable conversations about barefoot and minimal shoe running due to the interest they generate when I wear them. They are very nice looking with the leather upper and the toes are just enough to be a conversation starter however not distracting as a work shoe. I prefer a shoe that has a lacing system for the added benefit of variable tightening. The velcro closure of the KSO Treks are nice as they do stay in place where as lace ups come untied at times. The design of the Treks is that they stay on your feet due to the shape and the closure that wraps around the ankle and straps down is for added adjustable fit. I ordered the mens size 42 since my feet were about half an inch too big for the womens version. There is no difference that I know of in the mens and womens. I would imagine that they are wider however the velcro closure allows for a more custom fit. I found them easy to get on after the first couple of times trying. If I put my toes in and get them adjusted and then slip my heel into the shoe it is much easier than slipping my whole foot into the shoes and then trying to get my toes adjusted. My toes fit nicely into the toe pockets and there is no discomfort having my toes in the pockets. I have not experienced the dreaded VFF stink after many miles of wear. I am not prone to stinky feet. I think its a matter of difference in my own personal flora since these shoes have been worn enough to warrant a bad oder and they still don't. I also thought that they were not as hot as I thought they would be in the warmer weather considering the leather upper. Again I am not prone to sweaty feet so that is a consideration. I plan to wear them again at the Living History Farms Race in November 2011 and they are my standard work shoe. They are great on trails that are not slippery and muddy although they preformed better than I had imagined they would. The lugs on the toes gave enough traction to feel confident going at a moderate pace downhill but not confident enough to run as fast on rough terrain as I felt like I could go. I held back worried about my toes being exposed and separated although the thickness of the sole was just right for protection and ground feel. Uphill they preformed beautifully allowing me to really dig into the ground. For hiking and trail running I think they did great especially when the terrain was steep going up in mud and dry going downhill. That seems to be the trade off. All in all they are a fantastic minimal shoe allowing for one to maintain a mid foot landing and are light and flexible with a great style. You can check out a huge variety of Vibrams Five Fingers at Travel Country including the KSO Treks! Good post. Thanks for the review. Iowa winter is slapping us here too and more to come later. LHF would be a great place to test them out. Great review. My hubbs has even parked an interest in Vibrams. I would love for something to spark his return to running...even if he only joined me for short distances sharing running would be great! I had about the same experience as you with my trek adding to that snow, with the same comments. I also used them with snow shoes: no cold feet if you keep moving. Even in wet condition, they act as a wet suit keepinng part of the warmth in the shoes. Excellent review. Vibrams are good for barefoot runners and I need to get my barefoot miles back up before I slip mine back on. I prefer to wear them on trails versus roads or sidewalks. I've got to get me some! I like the stink-review. I have the same issue sans socks. I'm afraid to wear my Nike frees without. Great review! I haven't worn mine since my achilles problem, but even if I end up not running in them much, I love to wear them for walking. Good review....I am still working my way up to run in my VFF. I got the sprints...and I've got my fingers crossed!